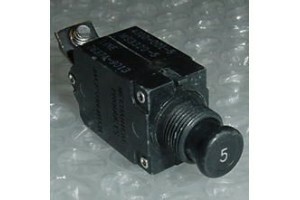 5A Slim Aircraft Circuit Breaker. P/N 4310-001-5 or MS3320-5. 5A Slim Aircraft Circuit Breaker. P/N 4310-001-5 or MS3320-5. Alternate P/Ns AS33201, AS58091, MIL-C-5809. NSN: 5925-00-452-1270. It was removed from a salvage aircraft.